Lychee is a tropical fruit tree native to China, where its cultivation dates back more than 2000 years. The fruit of the same name, which derives from the Mandarin word “Ihizi” meaning “leave its branches” are borne by hanging clusters, each having between several units to several dozens of small round fruits about 4 cm in diameter. Every fruit has a rough bark covering that turns reddish-pink when ripe. This is why lychees are also called “Chinese cherries”. After picking, the skin colour turns browns fairly quickly but the flavour and quality of the fruit remain. The flesh is very juicy, white and tender. It tastes and smells like roses. 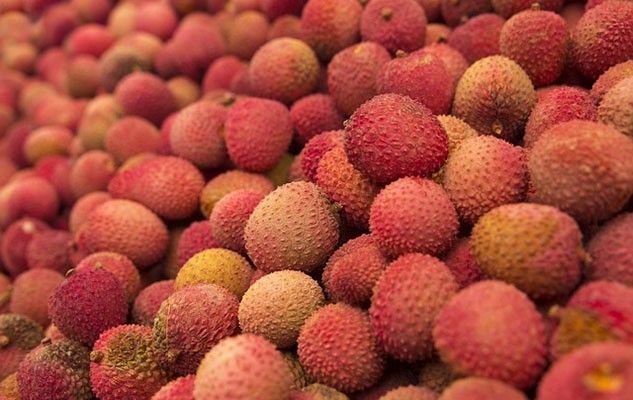 Whether they are grown in the northern hemisphere (especially in China) or in the southern hemisphere (Madagascar, South Africa) lychees are available in summer or during winter-spring. Always choose fruit whose skin is intact and free of mould. They can be stored in the refrigerator for ten days. They are refreshing, low in calories, and rich in vitamin C and B. Originally published in the Journal de Montréal on April 4, 2014.